Slice banana onto your morning cereal or porridge or add to your favorite dish with minimum fuss and effort. A handy kitchen gadget for anyone who likes bananas, the slicer cuts perfectly even slices in a fraction of the time it takes using a knife. It’s great if you just want to cut up a few slices, its sharp stainless steel blades cutting 5 pieces in one go, and perfect, too, for making fruit salads and desserts. Can also be used for Hot Dogs! Who's got time to chop slice by slice by slice. Go five in one go and stop being slow. 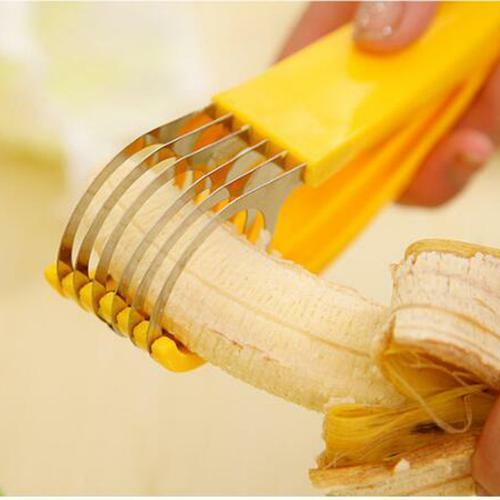 Live life in the fast lane with the vegetable and banana slicer.